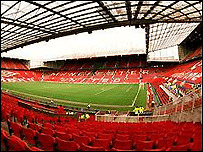 Manchester United has accepted a lottery grant of £30,000 to increase the health and fitness of its staff. The money has been granted to the club from Sport England. Over three years it will fund yoga lessons and lunchtime walking sessions for staff. The club - which is the second richest in the world - will also put £30,000 towards the scheme. "Just because we are a sporting organisation does not mean that all of our staff are fit," a spokesman said. "This is all about getting staff in sedentary jobs active and getting them to take fewer days off sick." Forty-one companies and organisations have been given lottery grants under the Sport England "£1 million challenge" fitness drive. Granada TV, Warrington and Rochdale councils, William Hulme Grammar School, the University of Bolton and a firm of accountants in Wigan will also benefit. A spokesman for Sport England defended the awarding of the grants. "We cannot and should not discriminate against a firm based on whether it is perceived to be a wealthy organisation. "But we should target those who will help make a real difference." Liberal Democrat MP for Manchester Withington, John Leech, criticised the grants and said the cash should go to people who cannot afford gym memberships. Mr Leech said: "This is not a good way to spend lottery money. "If there was an all party parliamentary group asking for free gym membership there would be an uproar." John Hannen, at the Greater Manchester Centre for Voluntary Organisation, said: "What these people have is the money to put together a professional looking application. "The National Lottery is overwhelmed with applications, so they will use the smallest excuse to reject one. "An under resourced voluntary organisation can find it hard to jump through all the hoops."